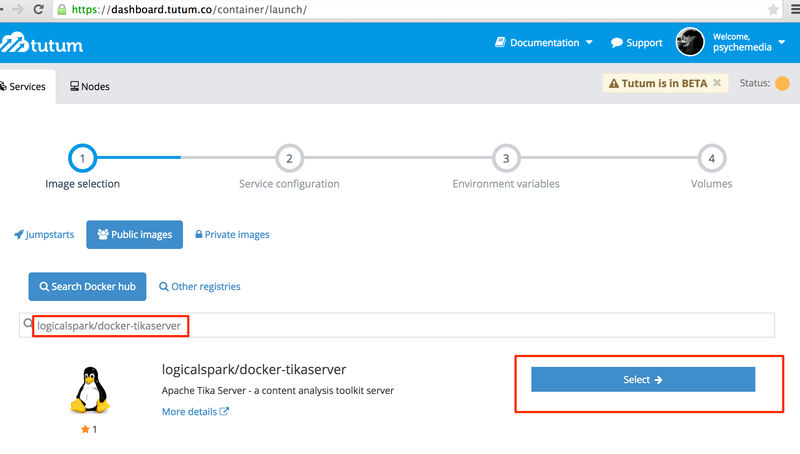 In several previous posts, I’ve shown how to launch docker containers in the cloud using Tutum Cloud, for example to run OpenRefine, RStudio, or Shiny apps in the cloud. Docker bought Tutum out several months ago, and now it seems that they’re running the tutum environment as Docker Cloud (docs, announcement). A nice feature of this is that you can 1-click start a container from your image repository if you have a server node running. The Docker Cloud service currently provides a rebranding of the Tutum offering, so it’ll be interesting to see if product features continue to be developed. One thing I keep thinking might be interesting is a personal MyBinder style service that simplifies the deploy to Tutum (as was) service and allows users to use linked hosts and persistent logins to 1-click launch container services with persistent state (for example, Launch Docker Container Compositions via Tutum and Stackfiles.io – But What About Container Stashing?). I guess this would mean linking in some cheap storage somehow, rather than having to keep server nodes up to persist container state? By the by, C. Titus Brown has some interesting reflections on MyBinder here: Is mybinder 95% of the way to next-gen computational science publishing, or only 90%? PPS So when are we going to get Docker Cloud integration in Kitematic, or a Kitematic client for Docker Cloud? So here’s what seems to me to be an easier, rather more pointy-clicky, wiring stuff together way using Docker containers (though it might not seem that much easier to you the first time through!). The recipe includes: github, Dockerhub, Tutum and Digital Ocean. The shiny server comes from a prebuilt docker container on dockerhub – rocker/shiny. This shiny server can run several Shiny applications, though I only want to run one: shiny_demo. The next thing I need to do is check-in my shiny_demo project into Github. (I don’t have a how to on this, unfortunately…) In fact, I’ve checked my project in as part of another repository (docker-containers). 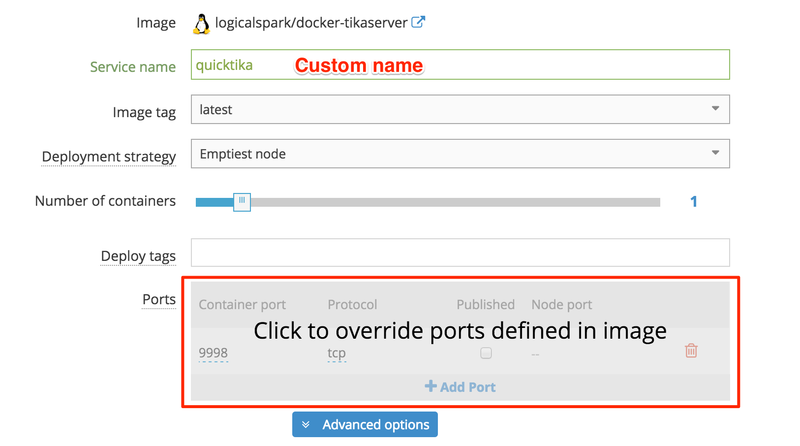 The next step is to build a container image on DockerHub. If I create an account and log in to DockerHub, I can link my Github account to it. Click on Trigger to build the image the first time. In the future, every time I update that folder in the repository, the container image will be rebuilt to include the updates. So now I have a Docker container image on Dockerhub that contains the Shiny server from the rocker/shiny image and a copy of my shiny application files. Now I need to go Tutum (also part of the Docker empire), which is an application for launching containers on a range of cloud services. 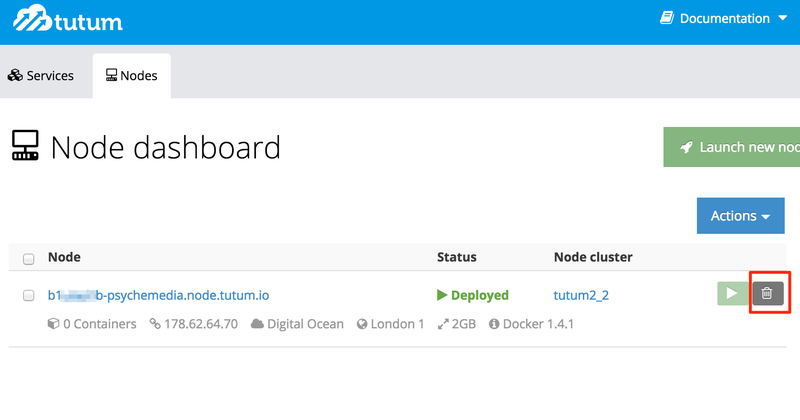 If you link your Digital Ocean account to tutum, you can use tutum to launch docker containers on Dockerhub on a Digital Ocean droplet. Select the image and then configure it – you may want to rename it, for example. One thing you definitely need to do though is tick to publish the port – this will make the shiny server port visible on the web. Create and deploy the service. When the container is built, and has started running, you’ll be told where you can find it. Note that if you click on the link to the running container, the default URL starts with tcp:// which you’ll need to change to http://. 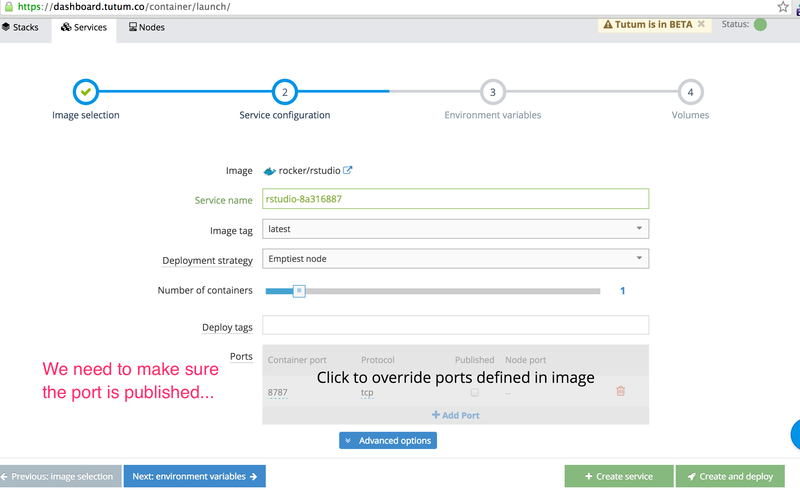 The port will be dynamically allocated unless you specified a particular port mapping on the service creation page. To view your shiny app, simply add the name of the folder the application is in to the URL. When you’ve finished running the app, you may want to shut the container down – and more importantly perhaps, switch the Digital Ocean droplet off so you don’t continue paying for it! However, once you do have your project files in github, you can then easily update them and easily launch them on Digital Ocean. In fact, you can make it even easier by adding a deploy to tutum button to a project README.md file in Github. 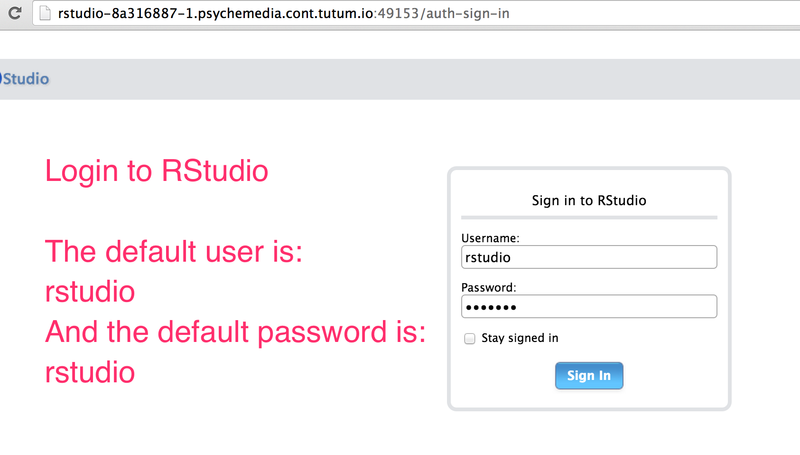 See also: How to run RStudio on Digital Ocean via Tutum and How to run OpenRefine on Digital Ocean via Tutum. docker build -t psychemedia/shinydemo . In the above, I set the port map (the service runs in the container on 3838, which I expose on host as localhost:8881. Alternatively, I could find a link to the server from within Kitematic. Via RBloggers I noticed a tutorial today on Setting Rstudio server using Amazon Web Services (AWS). Having launched a server (also described in Getting Started With Personal App Containers in the Cloud), we can now create a new service that will fire up an RStudio container. So, assuming the Amazon sign-up process is painless, I’m assuming it shouldn’t be much harder than that? PS see also: How to Run An R Shiny App in the Cloud Using Tutum, Digital Ocean and Docker Containers. 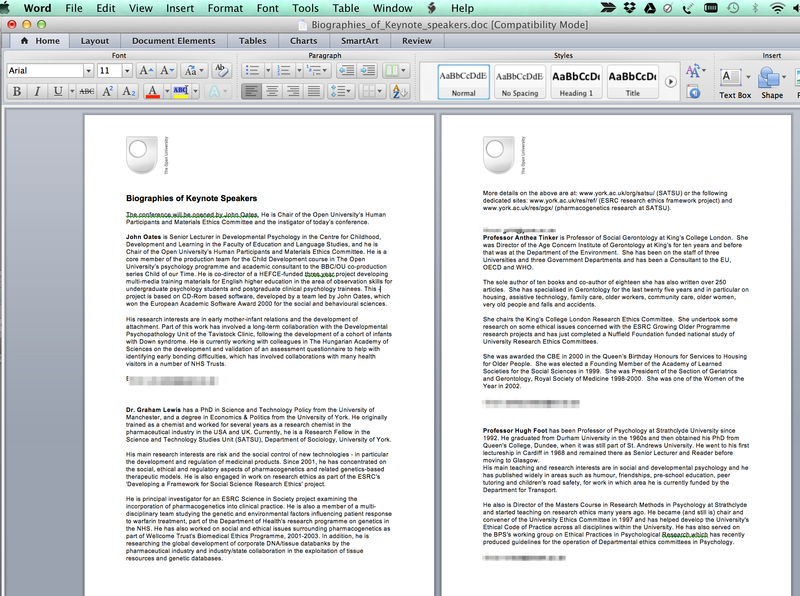 So you’ve got a dozen or so crappy Word documents collected over the years in a variety of formats, from .doc to .docx, and perhaps even a PDF or two, listing the biographies of speakers at this or that event, or the members of this or that group (a set of company directors, for example). And your task is to identify the names of the people identified in those documents and the companies they have been associated with. 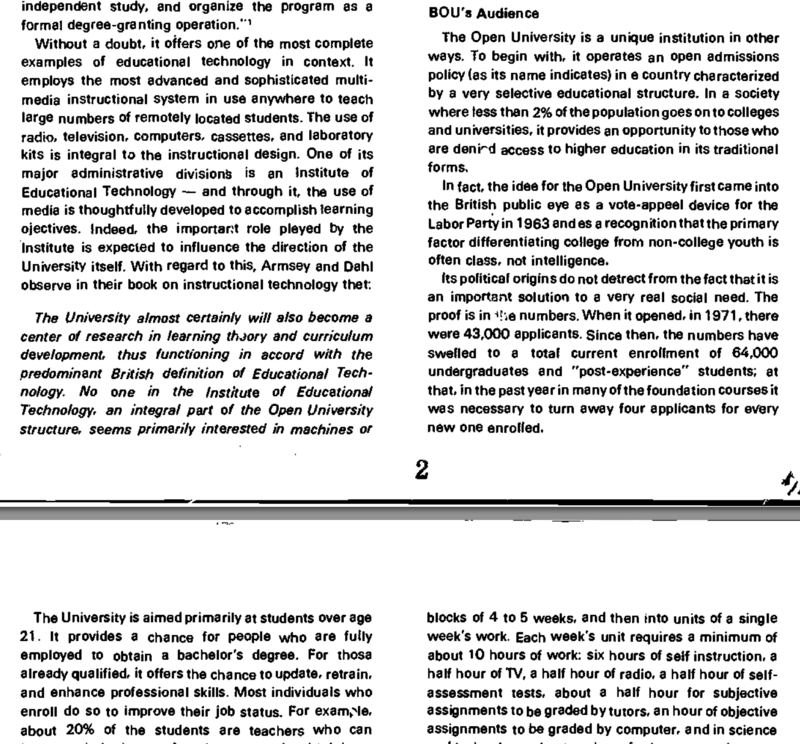 Or you’ve been presented with a set of scanned PDF documents, where the text is selectable, or worse, a set of png images of text documents. And you have a stack of them to search through to find a particular name. What do you do? Apart from cry a little, inside? If the documents were HTML web pages, you might consider writing a scraper, using the structure of the HTML document to help you identify different meaningful elements within a webpage, and as a result try to recreate the database that contained the data that was used to generate the web pages. But in a stack of arbitrary documents, or scanned image files, there is no consistent template you can work with to help you write the one scraper that will handle all the documents. So how about a weaker form of document parsing? Text extraction, for example. 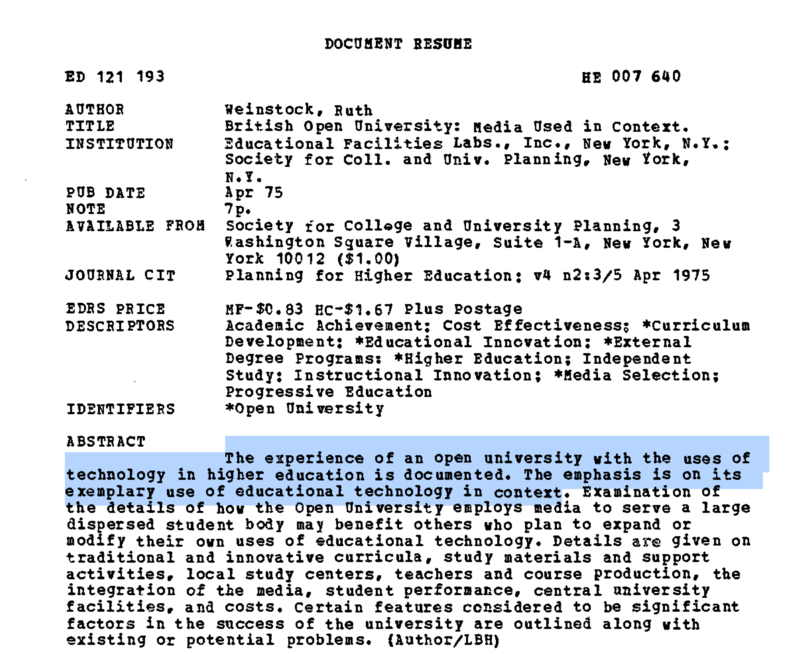 Rather than trying to recreate a data base, how about we settle for just getting the text (the sort of thing a search engine might extract from a set of documents that it can index and search over, for example). Apache Tika is like magic; give a document and it’ll (try) to give you back the text it contains. Even if that document is an image. Tika is quite a hefty bit of code, but it’s something you can run quite easily yourself as a service, using the magic of dockers containers. 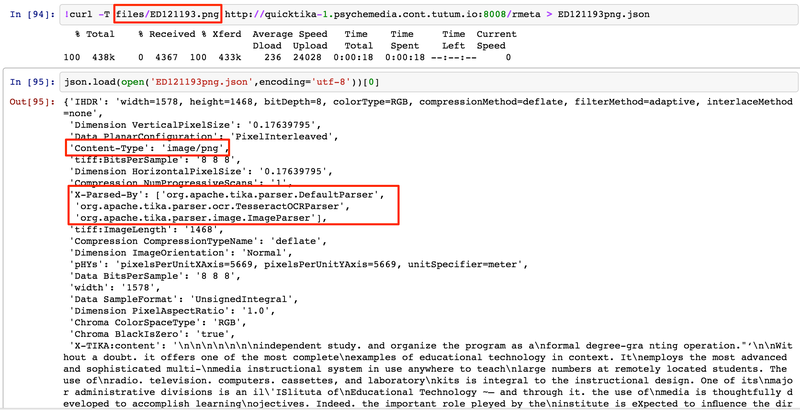 In my case, I had Apache Tika running at the address http://quicktika-1.psychemedia.cont.tutum.io:8008/tika (that address is no longer working). I was working in an IPython notebook running on a Linux machine (the recipe will also work on a Mac; on Windows, you may need to install curl). Having got your cloud provider account set up, create an account with Tutum and then link your Digital Ocean account to it. 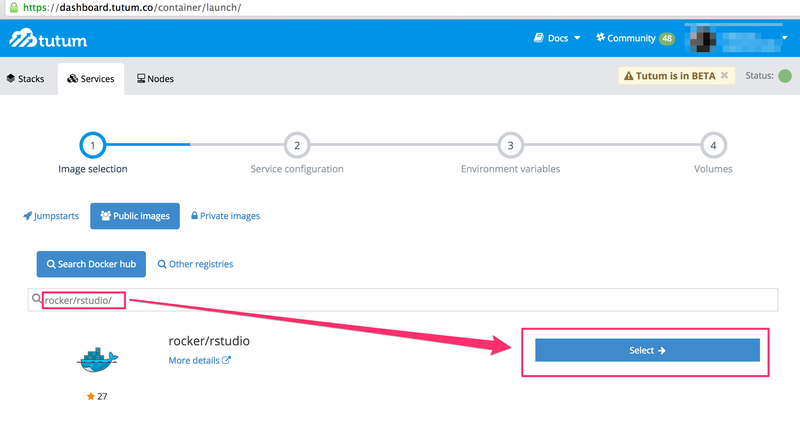 Launch a node cluster as described at the start of Getting Started With Personal App Containers in the Cloud. The 2GB/2 core server is plenty. Having created and deployed the container, look up it’s address from the Endpoints tab. The address will be something like tcp://thing-1.yourid.cont.tutum.io:NNNN. You can check the service is there by going to thing-1.yourid.cont.tutum.io:NNNN/tika in your browser. When you’re don terminate the container and the node cluster so you donlt get billed any more than is necessary. 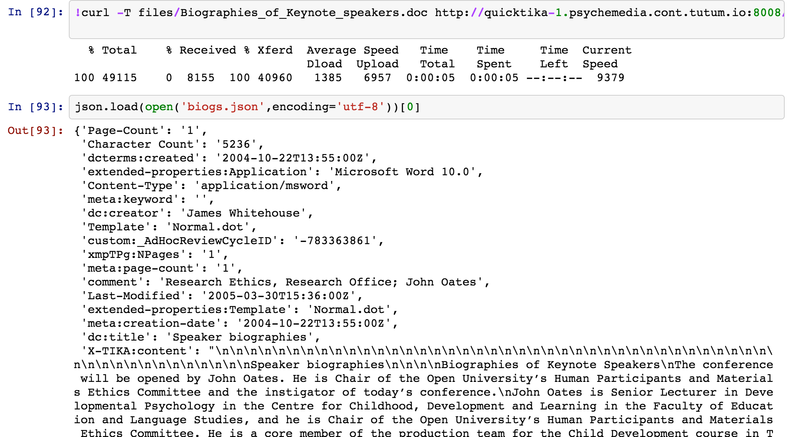 PS via @Pudo, see also: textract – python library for “extracting text out of any document”.